An exploration of ranking changes attributed to updates that are not officially recognized by Google. The post Why You Shouldn’t Panic About Unofficial Google Updates by @martinibuster appeared first on Search Engine Journal. Earlier this month, Google rolled out the beta version of its new and improved Search Console to all verified users. Google has been testing the new Search Console for some months now, with a select number of users given early access to the beta. We’ve had sneak peeks at the slick, clean interface, and heard about some of the notable additions, such as the much-vaunted 16 months of historical search data now available to SEOs. The new Search Console is still in beta, and Google says that it will continue to port features from the old Search Console to the new over the course of the coming year. Webmasters and SEOs will be able to use both versions of Search Console side-by-side until the transition is complete. So now that the new Search Console is finally here, what shiny new features does it boast, what is more or less the same, and what functionality are we still awaiting with bated breath? Let’s take a look. The most powerful new functionality in the revamped Search Console centers around the Search Analytics section, now known as Search Performance. As with the old Search Analytics report, you can overlay total clicks, total impressions, average CTR and average position data on top of each other with a simple click. But where webmasters have previously forced to choose between filtering by search type, query, page, country, and device, with only one option available to select at once, now you can filter by multiple variables at a time. So, as in the screenshot above, you can compare total impression data with average CTR from web searches for “search engine” from the United States over the past three months, if that’s something that takes your fancy. You unfortunately can’t layer multiple comparisons on top of each other – so if you want to compare desktop and mobile data side-by-side, you can’t also compare data from the U.S. and the U.K. at the same time – but the new options still allow SEOs and webmasters to get highly specific with performance data for their website. And, of course, website owners now have access to much wider date ranges for their historical search data, making it easier to analyze longer-term trends and perform year-over-year comparisons. Google notes that, “Over the years, users have been consistent in asking us for more data in Search Analytics” than the three months that website owners were previously limited to. Well, with the new Search Console, Google has exceeded all expectations, more than quadrupling the maximum date range that webmasters have access to. Now, you can choose between three-month, six-month and 12-month date ranges, or opt for the “Full duration”, which is a whopping 16 months. The Index Coverage section of Google’s new Search Console is a combination of the old Index Status and Crawl Errors reports. It allows site owners to see how well Google is indexing their website, as well as identify and fix errors where there are any. You can view data by pages with errors, valid pages with warnings, valid pages that have been indexed, and excluded pages, and also overlay impression data on top. The table underneath then gives more detail as to the types of issues detected, allowing webmasters to click through and inspect the affected URLs. Another fantastically useful feature that’s new with the revamped Search Console is the ability to request Google update its index after you’ve resolved an issue. Google’s updated AMP status report also allows website owners to validate newly-fixed AMP URLs. In the old version of Search Console, Google would provide a list of AMP URLs with errors and recommend a fix, but there wasn’t any way to request that Google reprocess the amended URLs. 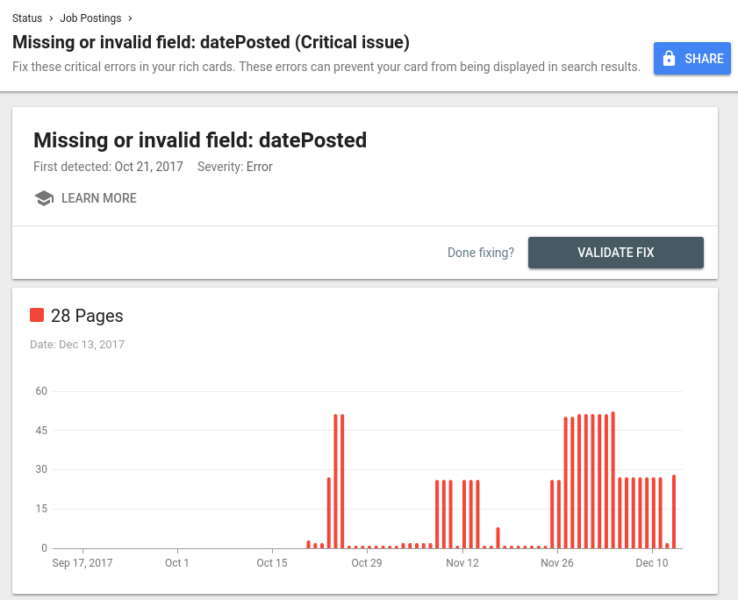 Now, you can request that Search Console validate a fix across multiple pages, and Google will again process those with a higher priority. Google’s blog post introducing the new Search Console grouped AMP under the heading of “Search Enhancements” together with another new report: job postings. Webmasters with job listings on their site can mark them up with Job Posting structured data to be eligible for Google Jobs – Google’s relatively new foray into the world of job listings that was announced at last year’s Google I/O. As with AMP, the Job Posting report in Search Console will display stats around your job listing results and pinpoint any indexing issues, allowing you to fix and validate them. Nothing in the revamped Search Console is exactly the same as the old version, but as I’ve mentioned, there are some rough equivalents. The new Search Performance report features much of the same data as the old Search Analytics report, and the Index Coverage report includes data that appears in the Index Status and Crawl Errors sections of the old Search Console. The sitemap submission process is also much the same in the new Search Console, though the handy “Test” button which allowed webmasters to check their sitemap before submission is missing in the new version. Sitemaps also work in conjunction with the Index Coverage report: when site owners submit a sitemap file, they can use the sitemap filter over the Index Coverage data to focus on an exact list of URLs. Judging by Google’s continued emphasis on rich results and structured data markup, these reports are certain to come to Search Console, though maybe not in exactly the same form as before. Given that Google has just begun introducing native support of some content types to Google Assistant, it’s possible that the new Search Console will feature additional functionality for integrating with Assistant, perhaps in the form of assessing whether your content is correctly optimized for inclusion in the new Actions Directory. Google might also find a way to incorporate its new Rich Results Testing Tool directly within Search Console, helping webmasters and SEOs find and fix errors that prevent rich results from displaying. One important piece of SEO functionality currently missing from the new Search Console is data on links: both internal links, and links leading back to your site. In the old Search Console, these are useful reports allowing webmasters to see exactly who is linking to their domain and which pages are the most linked-to – important for monitoring the progress of link-building campaigns as well as backlinks in general. Similarly, the Internal Links section allows you to assess and improve the level of internal linking within your own site. You can search for individual pages to see where they are linked to across your site, and reverse sort to find out which pages need more internal linking. Hopefully this will soon be introduced to the new Search Console so that webmasters can benefit from new and improved link reports and data. This report allows webmasters to target an audience based on language and country – a crucial section for international SEO. Webmasters who operate in multiple geographies will be particularly keen to find out what this looks like when it appears in the new Search Console. Given Google’s increasing emphasis on a mobile-first approach to website-building, I’m confident that we can expect some souped-up features in the mobile usability report when it appears in the new Search Console. The Search Console mobile usability report currently assesses how well your site is optimized for mobile usage, and highlights issues such as Flash usage, small font size, touch elements (e.g. buttons) placed too close together, and the use of interstitial pop-ups. With page speed confirmed to be an official ranking factor on mobile from July, I think we can near enough guarantee that speed will be one of the assessments included in the new mobile usability report (or whatever Google decides to call it) when it rolls out. I think it’s reasonable to predict some sort of tie-in to the mobile-first index, as well. While it’s already possible to compare mobile and desktop search data in Search Performance, Google may well build some additional functionality into the mobile usability report which allows webmasters to detect and correct issues that prevent them from ranking well on mobile. The current report already detects mobile usability issues on individual pages, so it wouldn’t even be much of a leap to apply that to the mobile-first index, giving website owners more tools to improve their site’s usability on mobile. What are your thoughts on the revamped Search Console? Which reports are you most excited to see in the new version? Share your views in the comments! Google rarely stands still. In fact, the search giant claims to tweak its search algorithms at least 3 times per day. Some of these updates are bigger than others, and the past month has brought an unprecedented wave of newsworthy enhancements. Just yesterday, for example, the industry was abuzz with the news that Google would officially be using page speed as a ranking factor in its mobile search algorithm from July. Not all of Google’s updates make a huge splash, however, and as a result some of them might have slipped under your radar. To help out, we’ve rounded up the 10 recent Google updates that are most likely to impact search marketers. Perhaps the most common request from SEOs to Google over the past few years has been to add more historical data to Search Console. The 3-month limit has always been a hindrance to SEO performance analysis, particularly as we have come to rely on Search Console for query-level data. After a period of beta testing, Google has now released a new version of Search Console, replete with 16 months of historical data. It will be rolled out slowly over the coming months, but many are already seeing the changes live in their dashboards. The historical data will soon be available via the Search Console API, too. To say this has been greeted positively in the industry would be an understatement. There is more to the new Search Console than additional data, however. The new Index Coverage report provides insight into the URLs Google has indexed from your site, along with explanations of any indexation issues. The ability to filter and segment data to a much more granular level than before will be a hugely beneficial addition. The Issue Tracking feature will also enable users to identify any indexation problems and share action items directly with team members. Finally, Search Console is bringing all the functionality SEOs need to analyze and impact performance. Google announced last week that its PageSpeed Insights tool will now use real world data, taken from the Chrome User Experience report. This move addresses perhaps the biggest drawback with PageSpeed Insights. Although the report’s intention (to reveal how quickly a URL loads) is an important one, its execution has been lacking, as its findings do not show how quickly a page loads for actual users. That has led many in the industry to use other resources for their page speed checks, including the Chrome User Experience report API. Given the importance of page speed for mobile users, particularly in light of Google’s upcoming Speed Update algorithm change, this update will be a very significant one. It will also provide better awareness of the stages of URL loading, which will help SEOs to communicate their desired changes to other audiences. The humble meta description has been given its biggest update for a considerable number of years. Google confirmed to Search Engine Land in December that the potential snippet length has increased to 320 characters, although this does not mean that all sites will receive this extra space. Nonetheless, there is evidence that there has been a general increase across the board in snippet length. Of course, this will lead marketers to question whether they should re-write their descriptions, and what the new character limit should be. One answer comes from Dr. Pete Meyers at Moz, who recommends a limit of 300 characters based on his recent research. That seems a useful rule of thumb, as Google has provided little insight into exactly how it decides where to truncate a snippet. In essence, Google wants to provide meta descriptions that reflect the changed nature of search results pages, and the devices on which people access them. The new character limit is not, in and of itself, reason to re-write descriptions across a website. It does, however, open up the possibility of some experimentation to try and gain a competitive advantage. The fundamentals of crafting meta descriptions remain the same; we just have more space in which to apply these best practices now. Google made a host of AdWords-based announcements in the run-up to the holidays. There is rarely a shortage of new features within the AdWords environment, but the release of new custom intent audiences was of particular interest. These audience lists allow marketers to add a much greater level of detail to their targeting of new customers via the Google Display Network (GDN), through the creation of audience segments based on topics or keywords. Even GDN novices will be able to introduce new prospects to their brand, as Google’s machine learning technology will analyze searcher data and automatically generate lists of users that would be open to hearing about a particular brand or product. This also chimes with the recent moves to make search advertising a more comprehensive discipline that encompasses upper funnel tactics, as well as the tried and tested lower funnel tactics that have driven its phenomenal success. Due to the ongoing competition with Facebook (plus the emerging threat from Amazon and Pinterest) for digital ad dollars, Google is investing heavily in new ways to provide value for marketers. Search engine results pages (SERPs) have come a long way from their early, text-only iterations. This has created opportunities for marketers to engage with their audience through a multitude of media formats in the SERPs, but it has created some confusion too. Not only are there different ways to mark up data, there are also plentiful different types of information that can be shown in the search results. Google has moved to categorize all of these under the umbrella term ‘rich results’ and the new testing tool (currently in beta) will reveal whether a specific URL is equipped to display rich snippets. Even with all of those points in mind, we should view this a step towards a much more accessible entry to rich results for all marketers. The Search Quality Raters Guidelines are one of the most fascinating and transparent resources if we want to understand Google’s methodology for ranking search results. Published on the Google Research Blog, the updated guidelines now include pointers for evaluating results on what Google terms “eyes-free technology.” The core focus here is the growth in Google Assistant interactions, underpinned by a realization that this new way of searching needs a way way of assessing the relevance of results. Information satisfaction: The content of the answer should meet the information needs of the user. Length: When a displayed answer is too long, users can quickly scan it visually and locate the relevant information. For voice answers, that is not possible. It is much more important to ensure that we provide a helpful amount of information, hopefully not too much or too little. Some of our previous work is currently in use for identifying the most relevant fragments of answers. Formulation: It is much easier to understand a badly formulated written answer than an ungrammatical spoken answer, so more care has to be placed in ensuring grammatical correctness. Elocution: Spoken answers must have proper pronunciation and prosody. Improvements in text-to-speech generation, such as WaveNet and Tacotron 2, are quickly reducing the gap with human performance. As we move towards new search interfaces, whether on the go or in the home, directives from Google make for invaluable reading. The full list of guidelines can be found here. Google has been trying to find the right balance with its reviews in both paid and organic listings. Although genuine customer reviews are helpful for consumers, some third-party platforms can be filtered by brands to highlight only the positive scores in search results. This is likely to affect the majority of paid search marketers and it follows the search giant’s attempts to clean up reviews in organic listings. The onus is on brands to provide a more transparent reflection of customer feedback if they want reviews to return to their PPC ads. Google My Business now allows both merchants and customers to add videos of up to 30 seconds in length. Importantly, business owners can also flag videos that they deem to be irrelevant or unhelpful. Google has also stated that native mobile support for this feature will follow in the near future. After a lengthy hiatus of about 3 years, Google has brought back its Webmaster Video series – now called ‘SEO Snippets’. These short videos, hosted on YouTube, will tackle the most common questions from the Webmaster Forums. Within the last month, the series has already tackled topics including the eternal ‘sub-domain or sub-folder’ question, dealing with multiple H1 tags, and the impact of fixed penalties on SEO performance. Google has been under significant pressure to ensure that YouTube ads appear alongside relevant content over the last year. The controversy that followed the story of major brands’ ads appearing alongside extremist content damaged Google’s revenues and reputation, albeit not irreparably so. Facebook has faced a similar struggle and it is one with no easy resolution. Monitoring the quantities of content uploaded to these sites every second is an uphill task, but Google is betting on the combination of people and technology to rebuild trust in YouTube ads. All content that is promoted via the premium ‘Google Preferred’ advertising channel will be reviewed by a team of over 10,000 moderators and AI-driven technology that helps to root out inappropriate content. There is a significant distance to travel before major brands trust YouTube to the same extent that they trust TV, but Google is taking measures to ensure that its highest-paying customers have some level of reassurance. Although many of these headlines have made waves in the industry, even the most vigilant search professional would be forgiven for missing a few during such an increased period of activity. Moving into 2018, the rate of progress in our industry is accelerating and marketers have more tools at their disposal than ever before to improve search performance. Google has implemented a subtle, new change to search results across mobile and desktop. The post Google Updates Search Results With New Labels for PDFs and PPTs by @MattGSouthern appeared first on Search Engine Journal. Google has updated many of their structured data developer docs yesterday. Aaron Bradley spotted it and posted about the changes in detail on Google+. Google updated its Test My Site tool to show how many visitors you may be losing due to page speed. The post Google Updates ‘Test My Site’ to Show How Many Visitors You’re Losing by @MattGSouthern appeared first on Search Engine Journal.